Tashichho Dzong, located close to Thimphu City and next to the banks of Wangchu River, was initially constructed in 1641 by Zhabdrung Ngawang Namgyal. It was later expanded and renovated for several times. The Dzong was damaged by an earthquake in 1897 and was rebuilt in 1902. In 1952, the Third King, Jigme Dorji Wangchuck moved Bhutan’s capital to Tashichho Dzong from Punakha, which is around 70 kms from Thimphu. Thereafter, as a centre of central government and administration, the Dzong witnessed a major face lift, expansion and renovation. 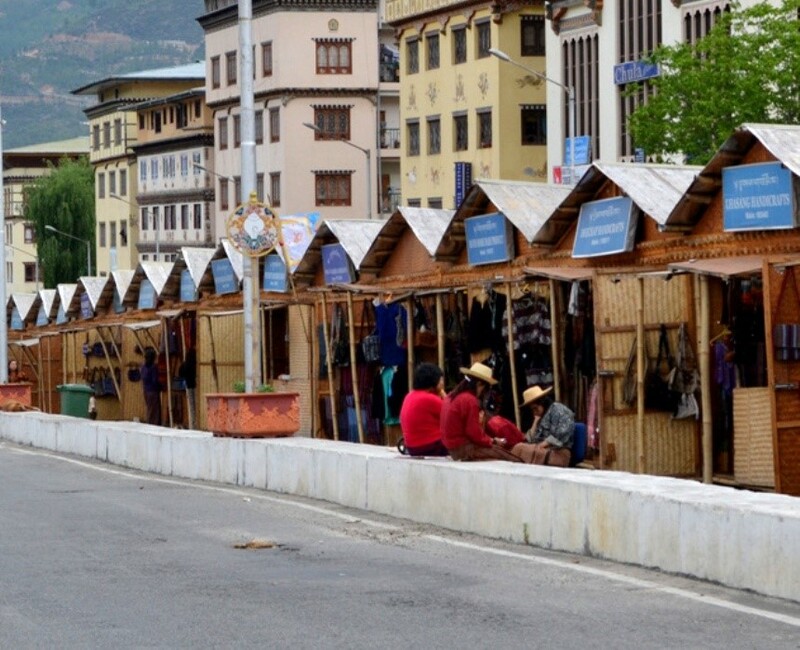 The Craft Bazaar is located in the heart of Thimphu City, just above Hotel Taj. The Bazzar/Market houses 80 traditional bamboo made stalls selling wide spectrum of Bhutanese handicrafts and textiles. With the products mostly sourced from rural communities, the bazaar aims to promote Bhutan’s craft industry through creation of a viable market while preserving and promoting Bhutan’s unique culture and traditional values. 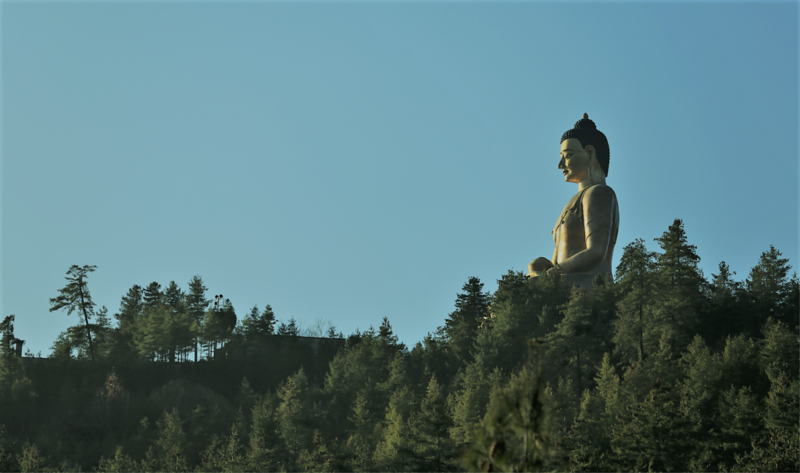 The Buddha Statue, Buddha Dordenma (statue of Buddha Shakyamuni) is located on the hilltop of Kuenselphodrang Nature Park. It is around 15-20 minutes drive from the Convention centre. As the location is on the hilltop, it provides a magnificent view of Thimphu city. This could be one ideal location, if one wishes to take picture of the entire Thimphu valley and Thimphu River. This statue is 51.5 m (169 feet) tall, making it one of the largest and tallest statues of Buddha in the world. It is made of bronze and gilded with gold. The statue houses 125,000 smaller bronze Buddha statues of which 100,000 statues are 8-inches-tall while the remaining 25,000 are 12 inches tall. The statue is dedicated to promote wellbeing, peace and happiness in the entire world. The National Memorial Chorten was built in 1974 in memory of His Majesty the Third King and dedicated to promote World Peace. It is a painted white and crowned with a golden spire. Visitors will see Bhutanese, especially elderly reciting prayers and circumambulating the chorten which is believed to be an act of accumulating merit. Dochula pass is located on the way to Punakha from Thimphu. It is a popular location among tourists as it offers a stunning 360 degree panoramic view of the Himalayan mountain range. The view is especially scenic on clear, winter days with snowcapped mountains forming a majestic backdrop to the tranquility of the 108 chortens gracing the mountain pass. 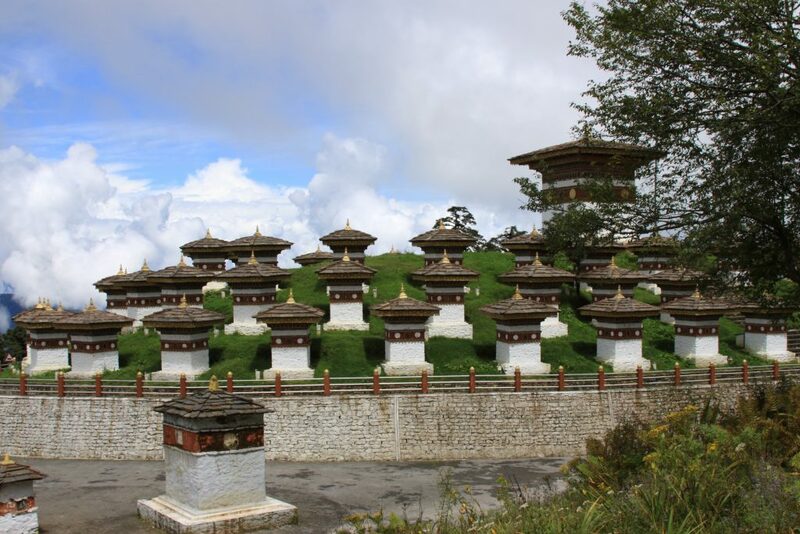 Bhutanese typically visit the pass during public holidays and weekends for picnic, circumambulating the chortens and paying visit to Dochula temple. However, for tourists, this location is commonly known for taking shots of stunning landscape with chortens and the beautiful Himalayan mountain range laden with snows. Punakha Dzong was built in 1637 by Zhabdrung Ngawang Namgyel. It was built at the confluence of two major rivers in Bhutan, the Pho Chhu to the right and Mo Chhu to the left. 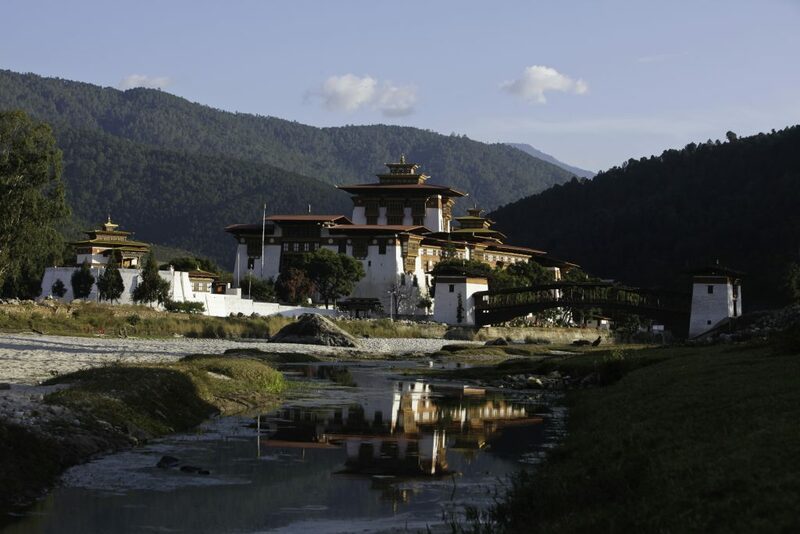 It served as the capital of Bhutan from 1637 to 1907 and the first national assembly was held there in Punakha in1953. Punakha Dzong is the second oldest Dzong in Bhutan. The Royal wedding of the King of Bhutan, Jigme Khesar Namgyel Wangchuck with Gyaltsen Jetsun Pema Wangchuck was held and celebrated in Punakha Dzong on 13th October, 2011. The Dzong is highly revered. It houses the mortal remains of Zhabdrung Ngawang Namgyal, the unifier of Bhutan and a sacred relic known as the Ranjung Karsapani which is believed to be self-created image of Avalokiteswara that miraculously emerged from the vertebrae of Tsangpa Gyarey, the founder of the Drukpa School. Punakha is located at an average elevation of 1200 m above sea level. Due to its favorable warm climatic conditions, Punakha is one of the rice growers of the country. As a landlocked, a Least Developed Country (LDC) and high dependence on climate sensitive sectors, such as, agriculture, hydropower, forest resources and transport system, Bhutan is highly vulnerable to the impacts of climate change. While the country is intrinsically exposed to and impacted by multiple climate change hazards including landslides, flashfloods, forest fires, droughts and windstorms, retreating glaciers and formation of supra-glacial lakes in the high mountain areas is one of the most significant climate change impacts observed recently in Bhutan. In 1994, a glacial lake outburst flood (GLOF) from a glacial lake known as Lugge tsho in Lunana caused 21 deaths and severe damage to public and livelihood assets in a number of communities in the Punakha-Wangdi valleys downstream. An inventory of glaciers, glacial lakes, and glacial lake outburst floods in Bhutan, conducted in 2001, identified 677 glaciers and 2,674 glacial lakes in Bhutan, and revealed that 25 glacial lakes posed a risk of flooding through the phenomenon of GLOF. The study also found numerous supra-glacial ponds which were becoming large and interconnected. The Thorthormi glacier was therefore considered as one of the most critical growing glacial lakes with GLOF threat in the near future. 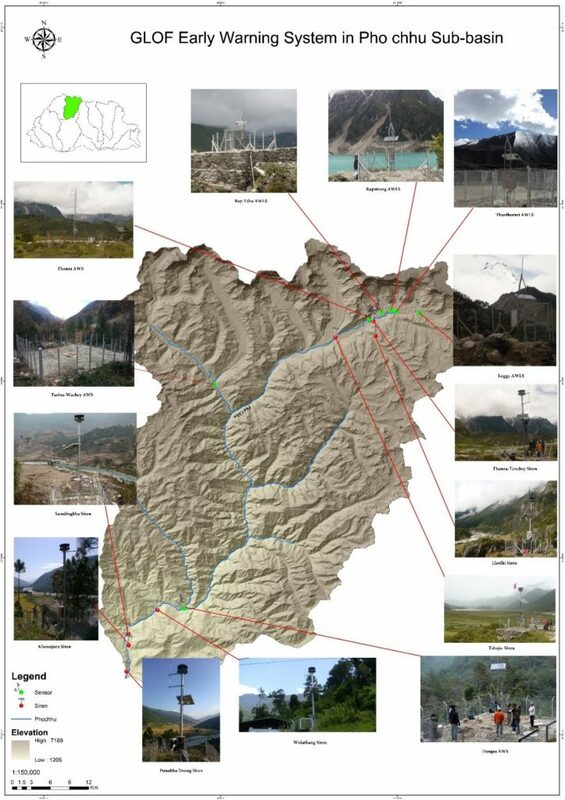 The Royal Government of Bhutan (RGoB), the United Nations Development Programme (UNDP) and Global Environment Facility (GEF) Project on “Reducing Climate Change-Induced Risks and Vulnerabilities from Glacial Lake Outburst Floods in the Punakha, Wangdue and Chamkhar Valleys (GLOF)” was implemented from 2008 to 2013 with a total budget of US $4.67 million, with co-financing from the UNDP, the RGOB, the Austrian Development Agency (ADA), the Punatsangchhu Hydropower Project Authorities (PHPA I & II) and the World Wildlife Fund (WWF). Through the project, Thorthormi glacial lake was artificially lowered by approximately 350 workers including arm forces and supervision of a multidisciplinary team of experts comprising engineers, geologists and seismologist. Thorthormi glacial lake is located in a place called Lunana, 4,300 metres above sea level, takes nine days to trek from the nearest motor able road and is accessible only 3-4 months a year because of extreme weather conditions. The glacial lake is one of the main sources of Punatshangchu river system which flows along Punakha-Wangdue valleys where urban settlements and cultural heritages sites, and country’s biggest hydropower plants are being built. The project also established GLOF Early Earning Systems downstream of Thorthomi lake. It comprised of procurement and installation of six automated water level monitoring stations, two automatic weather stations, 18 early warning sirens and a Flood Warning Control Station (FWCS) manned by two technicians 24 hours a day. The FWCS is linked with the Flood Warning System of Bhutan and shares water level data with the Indian States of Assam and West Bengal. The system covers more than 90 % of households in the 21 vulnerable communities downstream of the Punatsangchu river in the Punakha-Wangdue valley amounting to 875 households, 4 schools, 2 Vocational Training Institutes, 1 Basic Health Unit, Department of Roads staff and workers, as well as an estimated 15,000 staff and workers currently employed by the Punatshangchu Hydropower Plant I and II projects. The participants will have the opportunity to visit the GLOF Flood Warning Control Station at Wangduephodrang, interact with the in-charge at the centre followed by visit to Samdingkha in Punakha to see the early warning sirens. Enhancing preparedness for glacial lake outburst floods. pgs 56-57. In Wymann von Dach et al eds. 2017. Safer lives and livelihoods in mountains: Making the Sendai Framework for Disaster Risk Reduction work for sustainable mountain development. Bern, Switzerland, Centre for Development and Environment (CDE), University of Bern. Adapting to the Himalayan Meltdown: Reducing the risk of GLOF in Bhutan. ( download from http://www.undp.org/content/undp/en/home/librarypage/poverty-reduction/voices-of-impact-undp-gef-25-years.html ) . I can get you in touch with the project beneficiaries mentioned in the article, and of course also with other Government officials. Taktsang Lhakhang or the Tiger’s Nest Temple is Bhutan’s most iconic landmark and religious site. The name Taktsang means “The Tiger’s Nest”. This temple is one of the most holy sites in the kingdom and clings impossibly into a sheer cliff which is 900 hundred meters above the Paro Valley. It was first built in 1692 at a cave where Guru Rimpoche meditated in the 7th century A.D. Legend states that Guru Rimpoche flew to the site atop the back of a tigress and meditated in the cave for 3 years, 3 months, 3 days and 3 hours to subdue evil demons residing within it. The cave has been considered a sacred since then and many famous saints have travelled to meditate in it. To reach Taktshang temple, one must take a up-hill hike of around 3 hours through beautiful shady pine forests and rhododendrons. Return journey from the temple to the temple base, road point is around 1 hour. Visitors believe that trip to Bhutan is incomplete if visit to Taktsang is not made. Source: Tourism Council of Bhutan and Book my tour Website.